Cardiomyopathy is a complex disease process. Though it can affect any age group, clinical manifestations most commonly appear in the third or fourth decade. The incidence of dilated cardiomyopathy DCM discovered at autopsy is estimated to be 4.5 cases per 100,000 populations per year, whereas the clinical incidence is 2.45 cases per 100,000 populations per year. Some cases of DCM regress with treatment, but most of the cases progress inexorably to refractory heart failure requiring cardiac transplantation. Heart failure is the most common presentation of DCM. Superior vena cava syndrome as a presenting feature of DCM has been rarely reported in literature. A 49-year-old male admitted with history of gradually progressive swelling of abdomen and lower limbs since last fifteen days, associated with fatigue, cough and weakness. Since one week prior to his admission he developed swelling of his face and upper limbs and mild headache. There was no history of diabetes, hypertension, palpitation, nocturnal dyspnea or any liver disease. He had history of occasional chest pain but never required any medication. He was a known smoker with approximate twenty-five pack years of smoking. His clinical presentation was very much suggestive of neoplastic etiology with superior vena cava (SVC) obstruction. Examination revealed mild pallor, facial puffiness, conjunctival redness, markedly distended internal jugular vein without any identifiable waveform [Figure 1]. There were distended chest wall veins. Ascites, pedal edema and edema of upper limbs were also present but disproportionately lesser than face. His pulse rate was 125/minute, irregular in nature, blood pressure 102/66 mm Hg, respiratory rate 26/min. 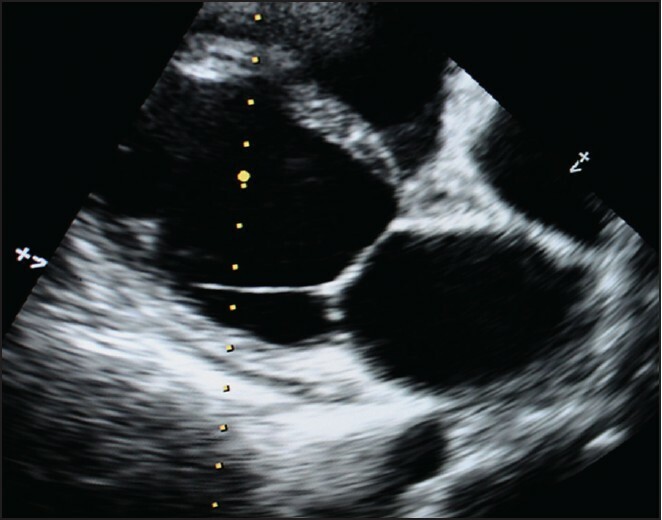 Cardiac examination revealed grade 3 pan systolic murmur in the lower left parasternal region. His liver was palpable 3 cm below right costal margin, elicited by dipping method. Other systems were normal. He had a hemoglobin value of 10.4 gm/dl. X-ray chest did not show any mediastinal widening but there was cardiomegaly. Electrocardiography (ECG) showed ischemic changes in inferior wall with atrial fibrillation. Ascitic fluid study showed elevated protein (3.4 gm/dl) with a serum-ascites albumin gradient (SAAG) value of 1.5. Cell count, sugar and adenosine deaminase level in ascetic fluid were normal. Ultrasonography of abdomen demonstrated mild hepatomegaly and evidence of hepatic venous congestion. Computed tomography (CT) scan of thorax failed to demonstrate any evidence of superior vena cava obstruction. Mean time the patient was already started with anti arrhythmic and oral diuretics but without of much symptomatic improvement. Enlarged cardiac silhouette in x-ray chest arose the suspicion of cardiomyopathy, which was later on confirmed by Echocardiography [Figure 2]. There was dilatation of cardiac chambers, left ventricular (LV) diastolic diameter 64 mm, LV ejection fraction 20% and moderate degree mitral and tricuspid regurgitation. 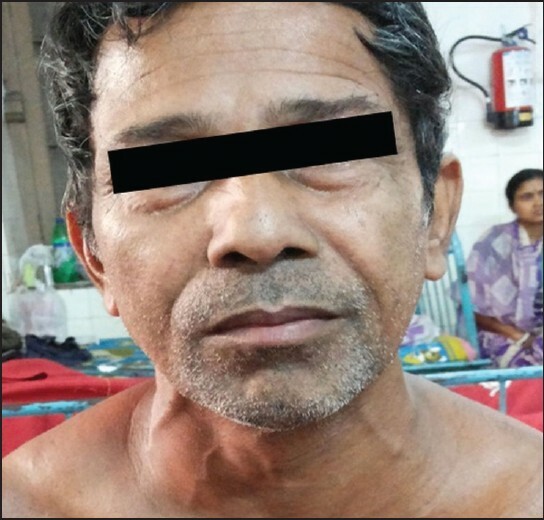 Diagnosis of DCM was confirmed and injectable diuretic brought dramatic response to the patient with diminution of swelling and disappearance of chest wall veins. He was discharged in stable condition with medication to manage his cardiac status. DCM is a disorder of cardiomyocyte, characterized by dilated and poorly functioning ventricular chambers. It causes global systolic dysfunction of the heart. The etiology of DCM is diverse and it includes, ischemia, familial, drug and toxin induced, nutrient deficiencies or idiopathic. Whatever may be the cause, DCM usually presents with cardiac failure, arrhythmia or embolization. In the later stage it may precipitate sudden cardiac death. Exertional dyspnea, fatigue, dependent edema and ascites are the common presentations. Jugular venous distension with prominent positive waves, S3 gallop, and regurgitant murmur at mitral or tricuspid valve can also be found. In our patient, ascites and mild dependent edema was present but additionally marked facial and upper limb edema and engorged nonpulsatile neck veins created a diagnostic dilemma. SVC syndrome commonly presents with dyspnea, facial, upper limb edema, distended nonpulsatile neck veins and chest wall venous prominence whereas dysphagia, dysphonia visual disturbances may be seen in advanced cases. Bronchogenic carcinoma accounts for the majority of causes of SVC syndrome, small cell variety being the most common. In our patient, the facial appearance, neck vein status, chest wall venous prominence and upper limb edema were very much akin to SVC syndrome, though ascites and pedal edema could not be explained. The rapidity of symptom onset and background history of smoking tempted us to search for a possible neoplastic etiology, which was further supported by lack of history of prior cardiac disease and poor response to oral diuretics. However, X-ray and CT scan of chest did not show any evidence of SVC obstruction or neoplatic changes. Cardiomegaly in X-ray and ECG finally led us to the appropriate diagnosis of DCM. Previously microembolization has been documented as an unusual presenting sign of DCM. SVC thrombosis in DCM has also been reported in a girl child. In our patient, no mechanical obstruction of SVC could be documented. Though rare, facial edema and neck vein distention can be seen in right heart failure. Increased right atrial pressure and lack of ambulation are the possible causes of facial edema and neck vein distention in this patient. Probably increased pressure of right heart was transmitted backward to cause venous hypertension with subsequent venous distension and edema formation. Whatever may be the cause, DCM mimicking SVC syndrome is very rare. This type of presentation of DCM should be kept in mind even in patients with a high probability of underlying neoplasia. 1. Rakar S, Sinagra G, Di Lenarda A, Poletti A, Bussani R, Silvestri F, et al. Epidemiology of dilated cardiomyopathy. A prospective post-mortem study of 5252 necropsies. The Heart Muscle Disease Study Group. Eur Heart J 1997;18:117-23. 2. Maron BJ, Towbin JA, Thiene G, Antzelevitch C, Corrado D, Arnett D, et al. Contemporary definitions and classification of the cardiomyopathies: an American Heart Association Scientific Statement from the Council on Clinical Cardiology, Heart Failure and Transplantation Committee; Quality of Care and Outcomes Research and Functional Genomics and Translational Biology Interdisciplinary Working Groups; and Council on Epidemiology and Prevention. Circulation 2006;113:1807-16. 3. Rice TW, Rodriguez RM, Light RW. The superior vena cava syndrome: Clinical characteristics and evolving etiology. Medicine (Baltimore) 2006;85:37-42. 4. Flounders JA. Oncology emergency modules: Superor vena cava syndrome. Oncol Nurs Forum 2003;30:E84-90. 5. Gillespie RL, Mullen GM, Costanzo-Nordin MR. Arterial microembolisation: An unusual presentation of dilated cardiomyopathy. Br Heart J 1990;63:63-5. 6. Kelly HA, Kam AK, Ramsay JM. Superior vena caval thrombosis in a child: An uncommon presentation of idiopathic dilated cardiomyopathy. J Paediatr Child Health 1990;26:62-4.